High-performing deformable secondary mirrors, and powerful, robust sodium lasers guide stars are becoming standard technology on the world’s largest telescopes. This is enabling a new level of reliability, sky coverage, and precision for adaptive optics (AO), with multiple configuration options for different science applications. In particular, wide field, high-strehl AO performance has been demonstrated at infrared wavelengths through the use of Multi-Conjugate Adaptive Optics (MCAO). The high actuator density possible with deformable secondary mirrors is also enabling diffraction-limited performance at optical wavelengths, as demonstrated by recent observations at various 8m-class telescopes. MAVIS proposes to combine these two developments, exploiting the full capabilities of the European Southern Observatory’s 4-laser guide star Adaptive Optics Facility, providing near-diffraction limited spatial resolution of an 8m telescope across a relatively large field of view. This Australian-led instrument will provide HST-like (or better) resolution from the ground, but with the light-gathering power of the Very Large Telescope (VLT), making it a powerful complement to future facilities like the space-based JWST and the 30-40m class ground-based telescopes currently under construction. We will present an overview of the foreseen MAVIS technical and scientific capabilities, and describe ways in which you can get involved in developing the science case for this exciting new instrument. Cepheids are primary extragalactic distance indicators as their pulsation period correlates with their luminosity — the so-called Period-Luminosity relation. Therefore, their contribution to precision cosmology is tremendous. However, the Cepheid distance scale needs to be accurately calibrated due to intrinsic biases in the P-L relation. The Baade-Wesselink (BW, or Parallax of Pulsation) method allows to derive Cepheid distances in a quasi-geometrical way, by computing the ratio of the linear radius variation (through the integration of the velocity curve) over the angular diameter variation during the Cepheid pulsation phase. Still, the BW technique is affected by significant uncertainties due to the so-called projection (p-) factor that lies between the real pulsation velocities (VP) and the measured, disc-integrated radial velocities (RV). Classical BW-derived distances are thus fully degenerate with this p-factor. I will present here the first results of a new spectroscopic approach, that aims at deriving directly the Cepheid photospheric (pulsation) velocities instead of the RV through the comparison of observed Cepheid line profiles with a library of synthetic line profiles generated for different VP, effective temperatures and other stellar parameters. Such an approach should allow a new insight inside the p-factor and its different components, and should lead to more accurate BW Cepheid distances. The optical integrated spectra of three LMC young stellar clusters (NGC 1984, NGC 1994 and NGC 2011) exhibit concave continua and prominent molecular bands which deviate significantly from the predictions of single stellar population (SSP) models. In order to understand the appearance of these spectra, we create a set of young stellar population (MILES) models, which we make available to the community. We use archival International Ultraviolet Explorer integrated UV spectra to independently constrain the cluster masses and extinction, and rule out strong stochastic effects in the optical spectra. In addition, we also analyze deep colour-magnitude diagrams of the clusters to provide independent age determinations based on isochrone fitting. We explore hypotheses including age-spreads in the clusters, a top-heavy initial mass function, different SSP models and the role of red supergiant stars (RSG). We find that the strong molecular features in the optical spectra can only be reproduced by modeling an increased fraction of about ∼ 20 per cent by luminosity of RSG above what is predicted by canonical stellar evolution models. Given the uncertainties in stellar evolution at Myr ages, we cannot presently rule-out the presence of Myr age-spreads in these clusters. Our work combines different wavelengths as well as different approaches (resolved data as well as integrated spectra for the same sample) in order to reveal the complete picture. We show that each approach provides important information but in combination can we better understand the cluster stellar populations. On August 21, 2017, the Airborne Infrared Spectrometer (AIR-Spec) observed the total solar eclipse at an altitude of 14.3 km from aboard the NSF/NCAR Gulfstream V research aircraft. The instrument successfully observed the five coronal emission lines that it was designed to measure : Si X (1.43µm), S XI (1.92µm), Fe IX (2.84µm), Mg VIII (3.03µm), and Si IX (3.94µm). Characterizing these magnetically sensitive emission lines is an important first step in designing future instruments to monitor the coronal magnetic field. During the eclipse observation, AIR-Spec measured the average linewidths, peak intensities, and center wavelengths of all five lines radially outward from the limb at four positions in the corona. One of the positions sampled a prominence, where a number of H I lines were also observed. The observation of Fe IX at 2.84µm was the first of that line. The radial intensity gradient of Si X was measured with high sensitivity, providing information on the dominant excitation processes for that line. The relative Doppler velocity of Si X was measured with a resolution of 5 km/sec, revealing variations across different coronal structures and an interesting case of bimodal velocities near the solar prominence. AIR-Spec is a slit spectrometer that measures light over a 1.55 Rsun field of view in four spectral passbands between 1.4 and 4 µm. The package includes an image stabilization system, feed telescope, grating spectrometer, and slit-jaw imager. Several follow-on experiments are being proposed to expand on the results from the 2017 eclipse, including a re-flight of AIR-Spec during the 2019 total eclipse, development of a new spectrometer or spectropolarimeter to observe the 2020 eclipse, and a laboratory study of infrared coronal emission lines. The High Angular Resolution (HRA) at optical wavelengths was re-born during the 1970-1980s, and led to impressive developments : worldwide with adaptive optics and at Paranal with the VLTI. The seminar will recall the European emergence of these during these years, along with the conception of the VLT/VLTI. ESO became then the focus of an intense exploration of an almost entirely new domain of observational astronomy, leading to a considerable scientific and technical activity, which prepared for the impressive achievements of the next 25 years. 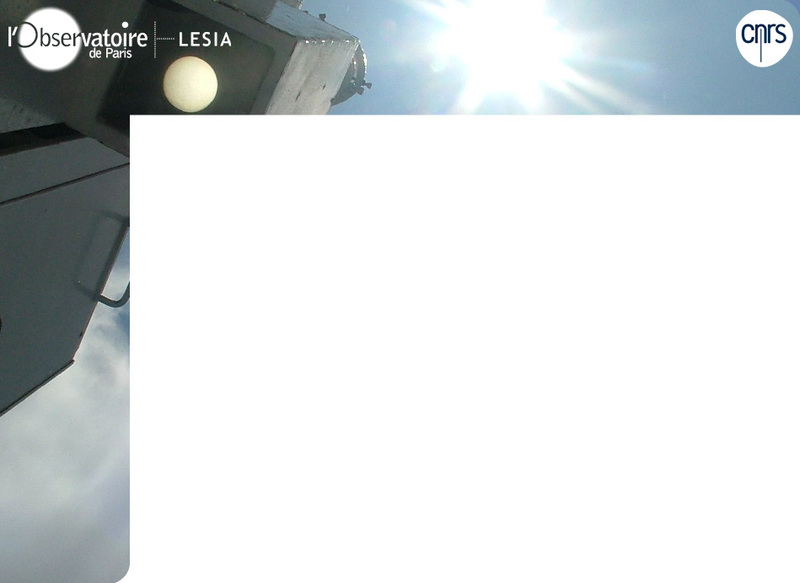 Je voudrais vous présenter ce que l’on a pu obtenir au LESIA par la superposition de cartes de champ magnétique ou courant électrique photosphérique (données SDO/HMI, inversion UNNOFIT faite au LESIA), d’émissions UV coronales (données SDO/AIA), d’émissions X coronale aussi (données RHESSI). En particulier, il a été remarqué dans les colloques où ces superpositions étaient présentées, que les émissions UV se situent préférentiellement au-dessus des zones à courant électrique montant (Jz > 0), là où ces courants sont suffisamment forts, c’est-à-dire dans les rubans d’éruptions. Cette corrélation dissymétrique a donné à penser à plusieurs théoriciens et je présenterai, aussi bien que je peux, leurs propositions d’explications. As most of you probably already know, PicSat stopped emitting on March, 20, 2018. The satellite was successfully launched from India in January, carrying an ambitious "fibered photometer" to Low-Earth-Orbit. This 1.5 kg / 2 W instrument was supposed to help us explore the Beta Pictoris system, detect the potential transit of Beta Pic b, study the dust tail of transitting exocomets. A proposal had even been accepted to trigger the HARPS spectrograph on alerts coming from the small satellite ! Unfortunately, none of this will happen, as the mission abruptly came to an end two months ago. I will present a retrospective of the project, from the early development of the payload, to the final integration of the satellite here in Meudon, and its deliverie(s) in Delft (Netherlands). I will also talk about the 10 weeks of operations : what we did, what we did not do, which data ’we’ (understand : ’radio-amateurs around the world’) received from the satellite, etc. All of this will lead me to summarize what we have learned from this short-lived mission, and what we plan to do next. In the last decades, inversion techniques have been the most fruitful tools for the seismic analysis of the solar structure. They have allowed for the determination of the radial profile of thermodynamic quantities such as the density and the sound speed, thereby validating the so-called "standard" solar models, until the downward revision of the photospheric abundances of carbon, nitrogen and oxygen casted doubts on these models. This talk will show how inversion techniques of new quantities such as the entropy or the Ledoux discriminant can help provide new insights on the solar modelling problem and guide theoretical developments to its resolution.in addition to the solar problem, this seminar will discuss the application of mean density inversions to the radial oscillations of red giants. This part of the talk will show howmean density inversions can be used to determine more accurate values of this quantity than using the usual scaling laws, taking into account all the information of the radial oscillation spectrum. Les inversions sismiques ont été durant ces dernières décennies les approches les plus fructueuses pour l’analyse de la structure interne du soleil. Elles ont permis de déterminer les profils radiaux de grandeurs thermodynamiques telles que la vitesse du son et la densité, validant ainsi les modèles dits "standards" du soleil, jusqu’à ce que la révision de l’abondance photosphérique de carbone, azote et oxygène ne sème le doute sur les modèles théoriques. Ce talk présentera comment la combinaison de multiples inversions de nouveaux profils de grandeurs thermodynamiques telles que l’entropie et le discriminant de Ledoux permettent de jeter un regard neuf sur le problème de la métallicité solaire et peut guider les développements théoriques vers sa résolution. En plus de traiter du problème solaire, ce talk abordera également l’application des méthodes d’inversion sismiques aux modes radiaux des géantes rouges. Ce volet portera sur l’extension des inversions de densité moyenne à la branche des géantes, permettant une détermination plus exacte de cette grandeur qu’au moyen des lois d’échelles car tenant compte de toute l’information du spectre des oscillations radiales.